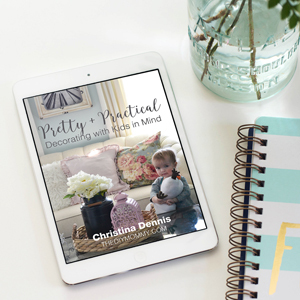 For outdoor decorating at our home this year, I’m going ga-ga over vintage farmhouse style decor! I’m loving beat up, galvanized accessories, lots of worn wicker, raw wood, and salvaged treasures. As much as I love vintage and antique decor, sometimes I just can’t find what I’m looking for at the price I can afford. 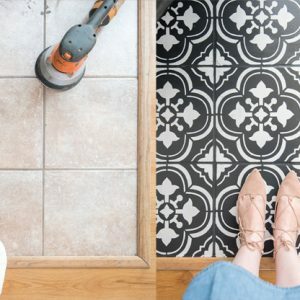 That’s when I turn to a good deal + some DIY to make what I have in mind! 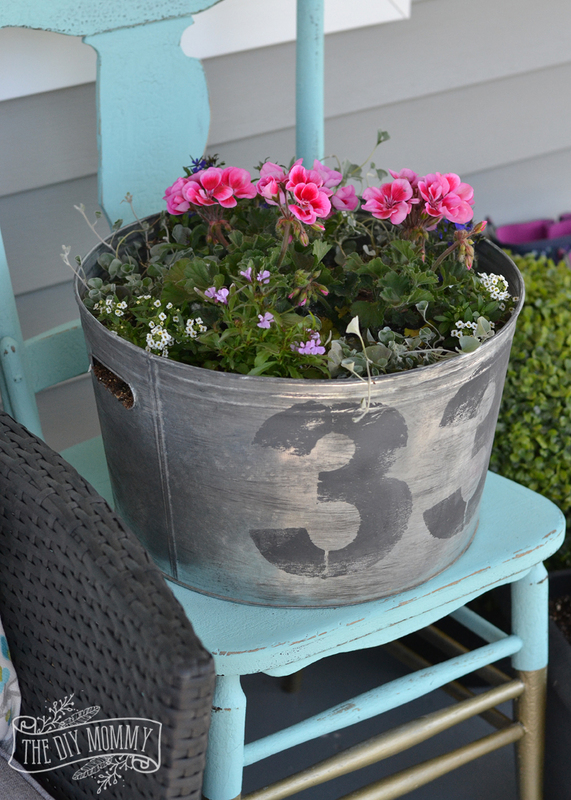 In this case, I really wanted a vintage galvanized tub that I could use as a flower planter for our porch. 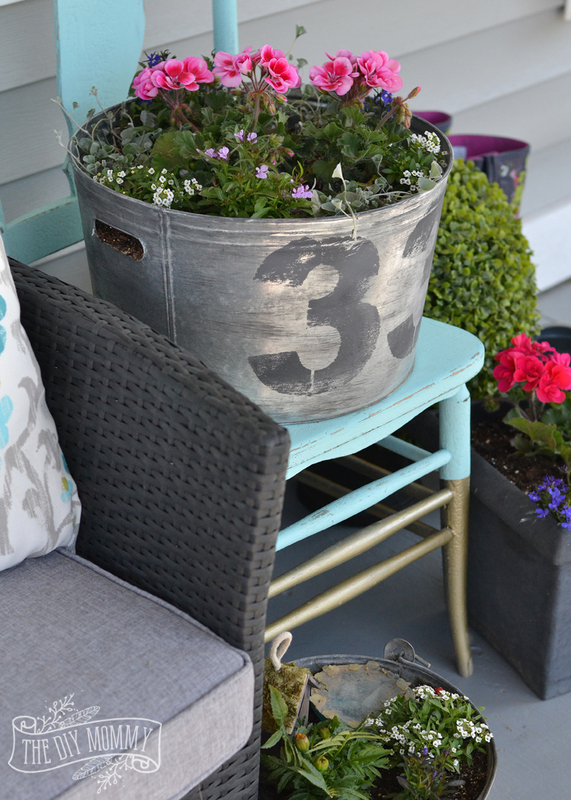 I simply couldn’t find one this Spring at a good price, so I made my own faux vintage galvanized planter that I think looks really close to the real, antique thing! Here’s how I made it. 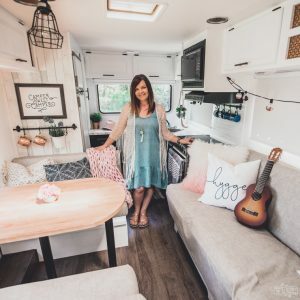 I’m really happy to be a part of the Outdoor Extravaganza blog hop this year with some of my favourite blogging friends! 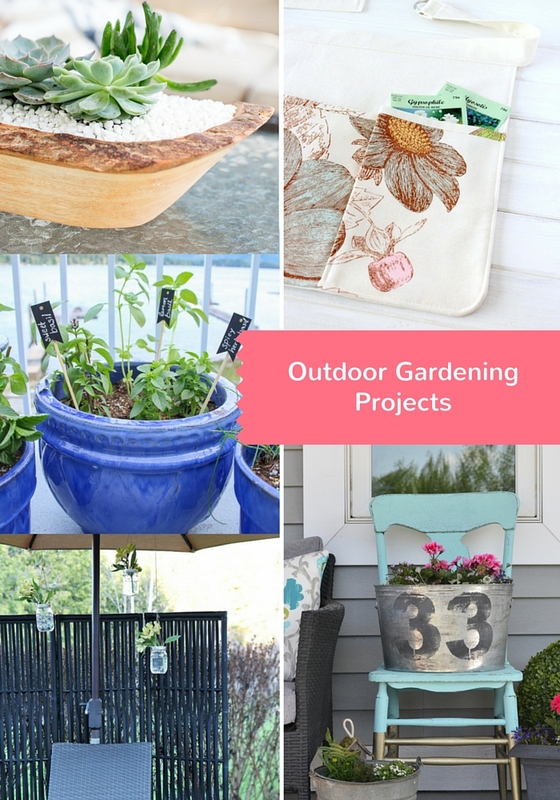 Please make sure to visit the other fabulous plant & flower ideas linked at the bottom of this post, and come back on May 27th to be a part of an epic outdoor decorating link party. 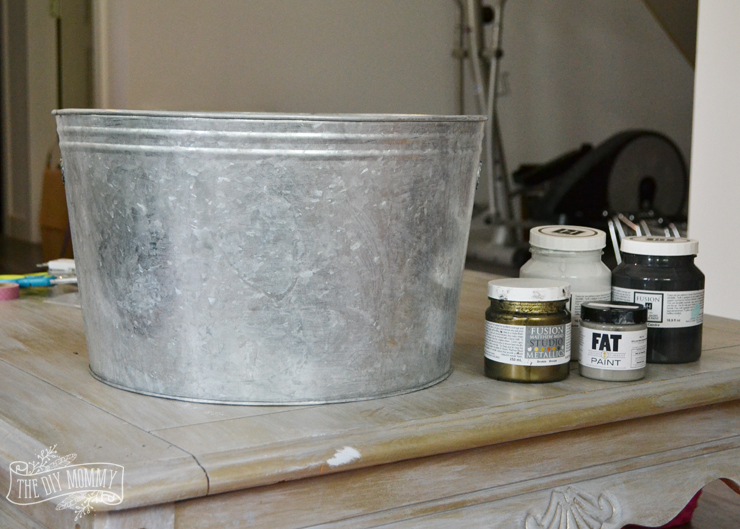 First of all, I used a coupon to buy this large galvanized steel tub from the craft store. It cost me $14 after I used a 40% off coupon which I thought was a great price for such a large container! I tried to distress the tub using this method first, but it just wasn’t working for me. I finally figured out that dry brushing it with some really dark grey chalk style paint gave it the vintage look that I wanted. To dry brush, simply put a very small amount of paint on your paint brush. I use the lid of my paint and dab my brush in ever so slightly. Then, blot your brush a little on a paper towel, and then lightly and quickly brush your surface so that only little streaks of paint are seen. You can see me do this technique on video here on this Mother’s Day gift box crate DIY. 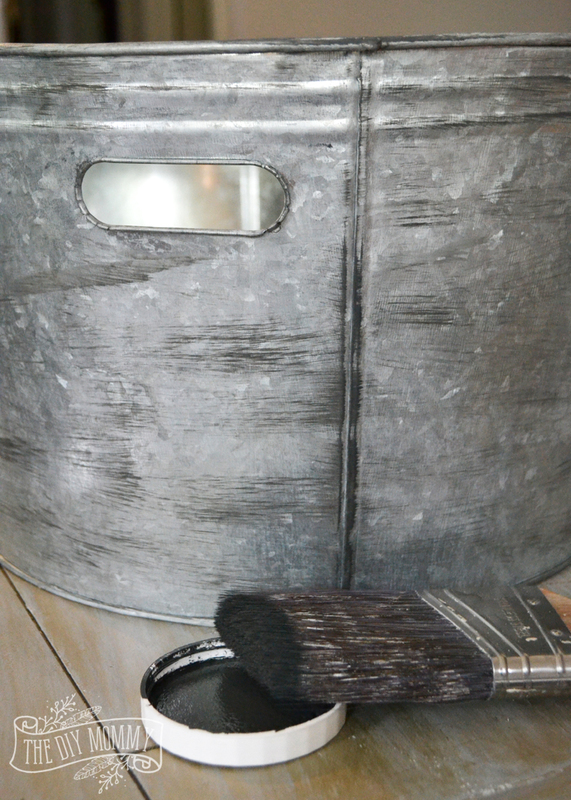 I dry brushed the entire outside of the tub, and I also painted a little bit of the inside top as well. 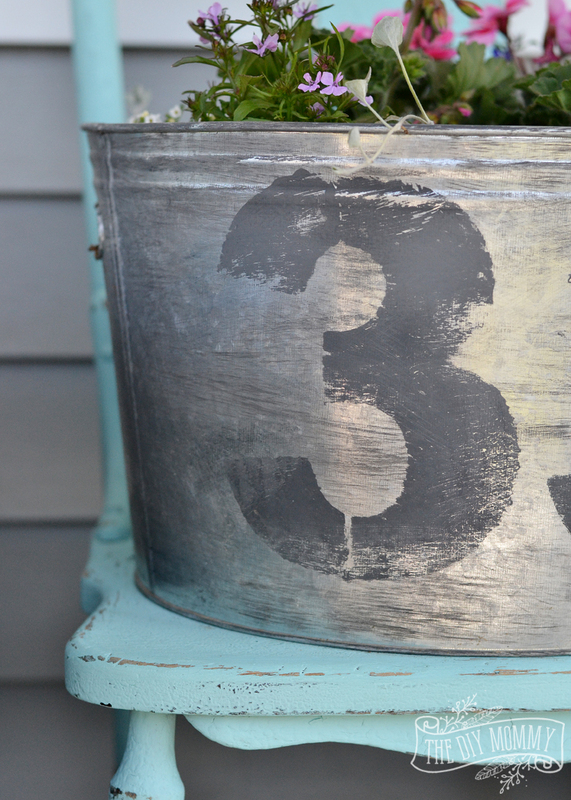 After the paint was dry, I took a number stencil, chalk style paint and a paint brush and stenciled my house number onto the tub. 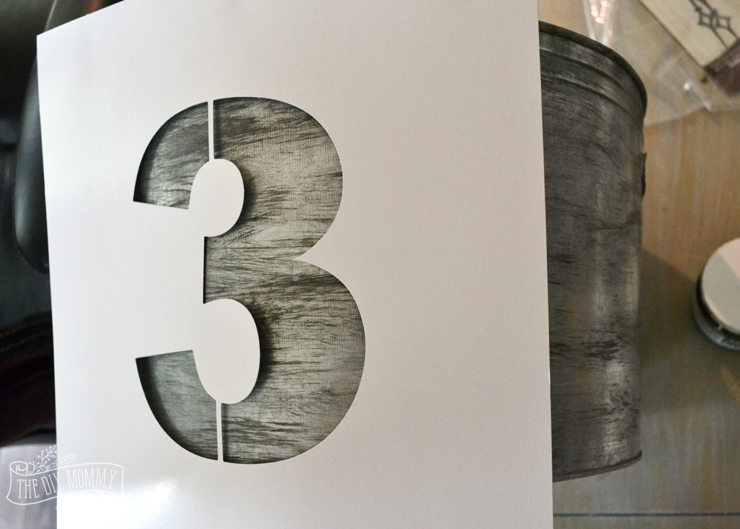 After stenciling the numbers and letting them dry just a little, I sanded them slightly to give them a weathered, distressed look. 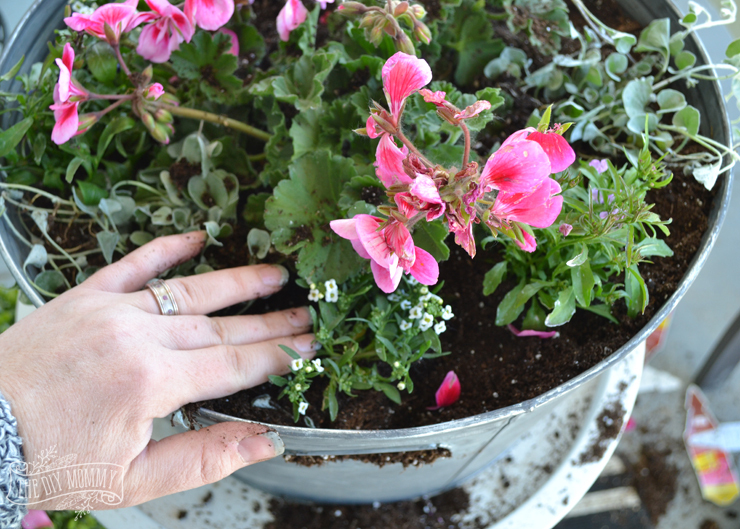 Once the bucket was dry, it was time to plant some flowers inside! 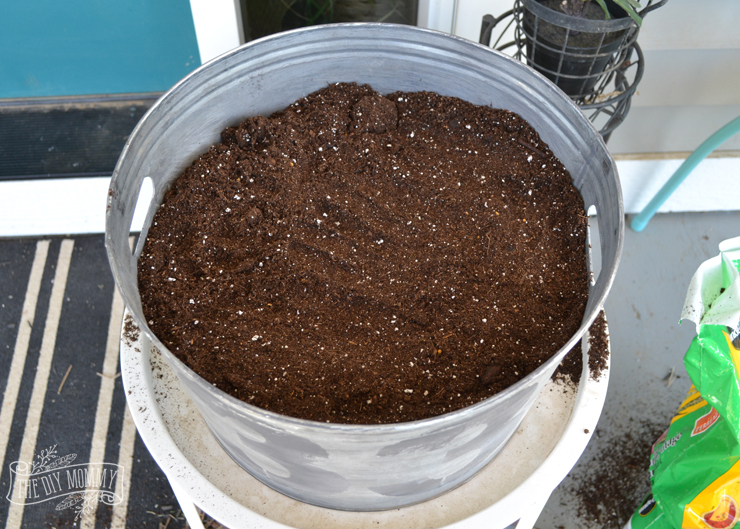 One of the tricks to using buckets as planters (if they don’t have draining holes) is to put a couple of inches of gravel and sand in the bottom of the planter so that the soil drains when it’s watered. 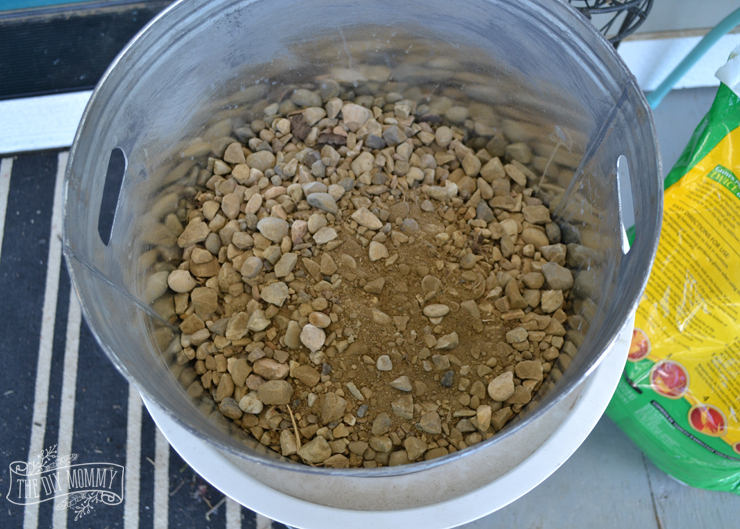 I grabbed a shovel-full of gravel from our driveway, and put it in the bottom of the bucket. Next, I layered in some potting soil. 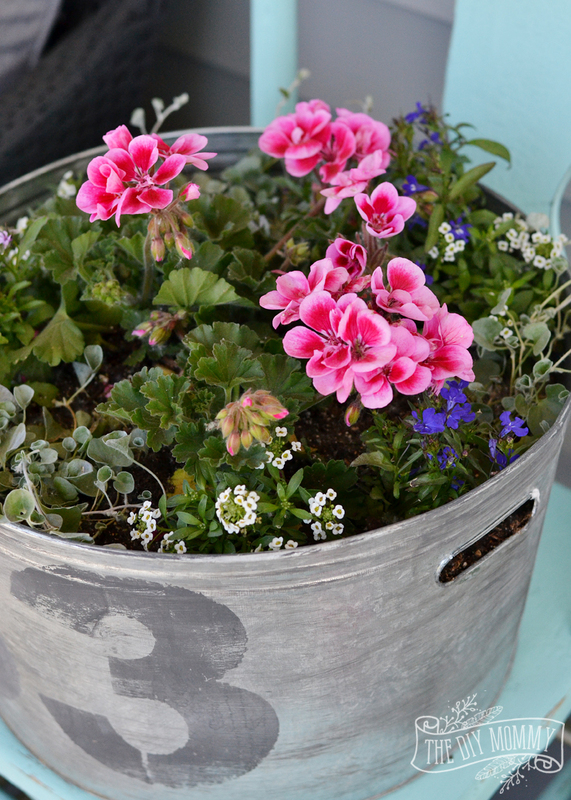 Finally, I planted some of my favourite little annual flowers inside the bucket. I’m aiming for a pink, purple and white floral colour scheme in our garden, so I planted some pink geraniums, white alyssum, and purple lobelia. A formula that works every time when you’re designing planters? Put a “thriller” plant in the middle of the planter that’s tall, colourful and upright (my geraniums), a “spiller” plant around the outside of the planter (my lobelia and) and a “filler” plant in the leftover spaces (my alyssum). My flowers are all still babies right now because our growing season just started, but I’ll definitely post another photo again this summer when this farmhouse-inspired flower planter has grown! 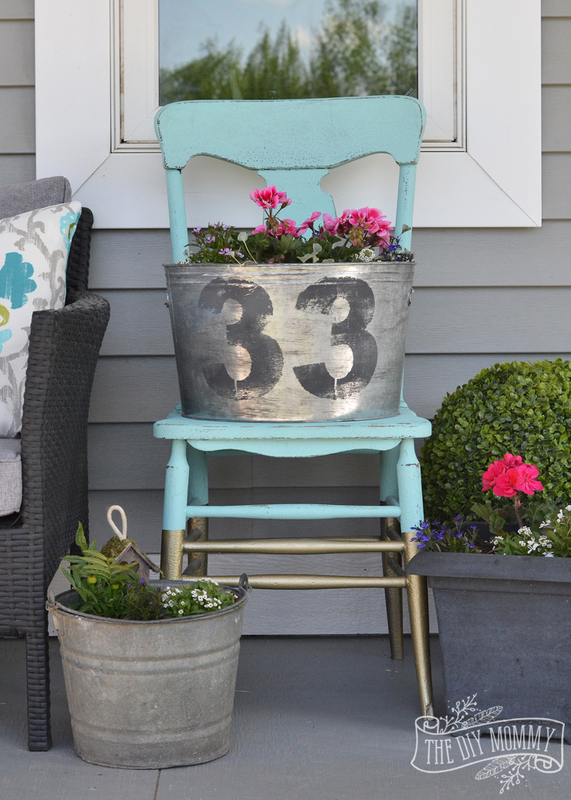 I placed the planter on an old chair that I painted to give it even more of a vintage farmhouse look. I really love this pop of aqua on my porch! You can also see a little bit of our new outdoor furniture which I’ll share with you next week. We’re loving it! 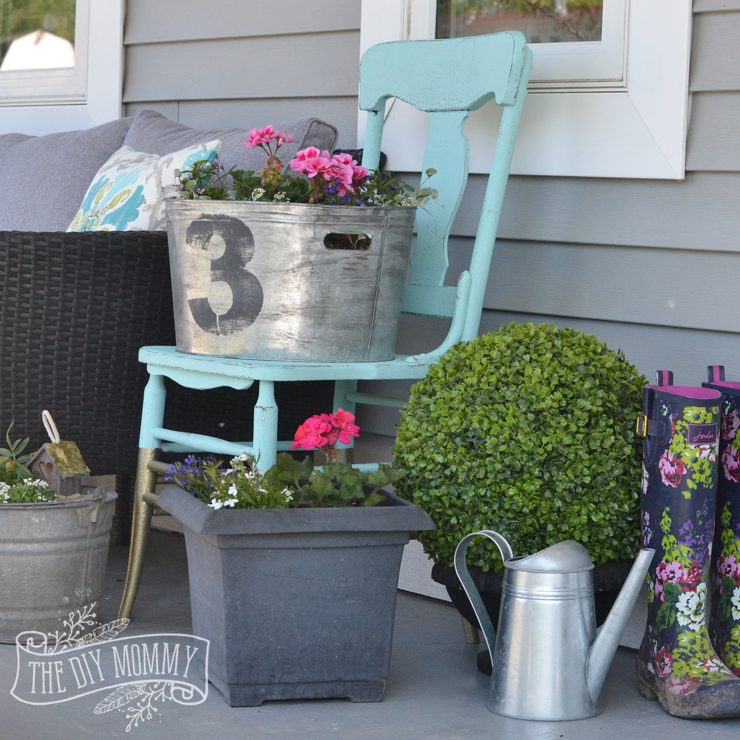 You definitely made this look like a vintage bucket- so clever! 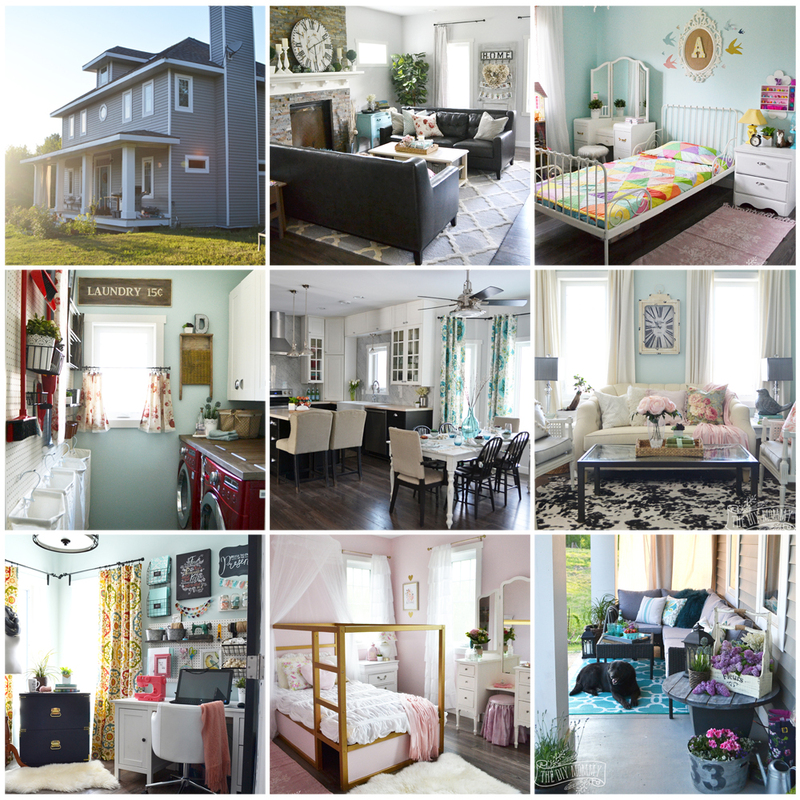 Your whole vignette looks great. Bright and cheery. Hopefully you took your pots inside if you’re getting the snow we are this morning. Strange weather, right? 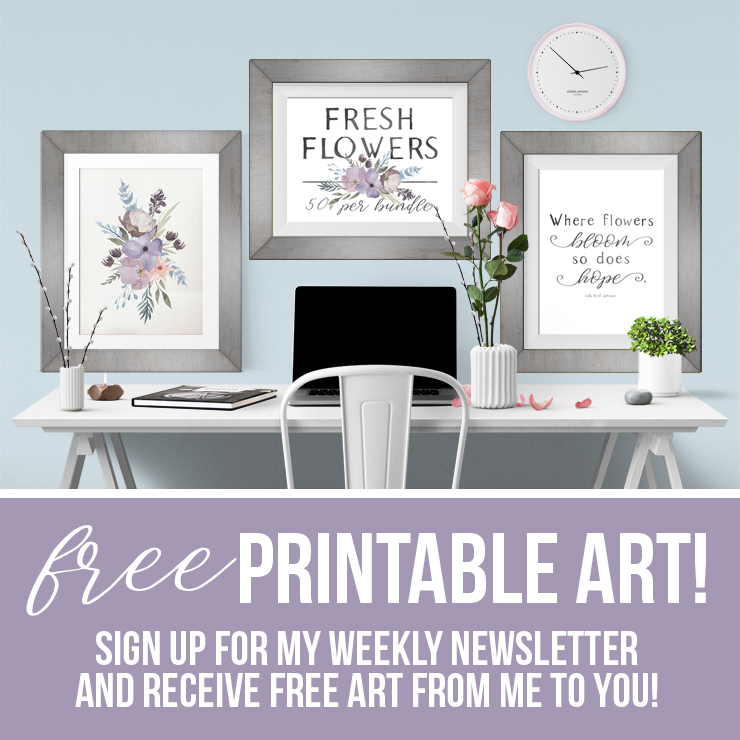 Love your painting technique Christina – gorgeous! 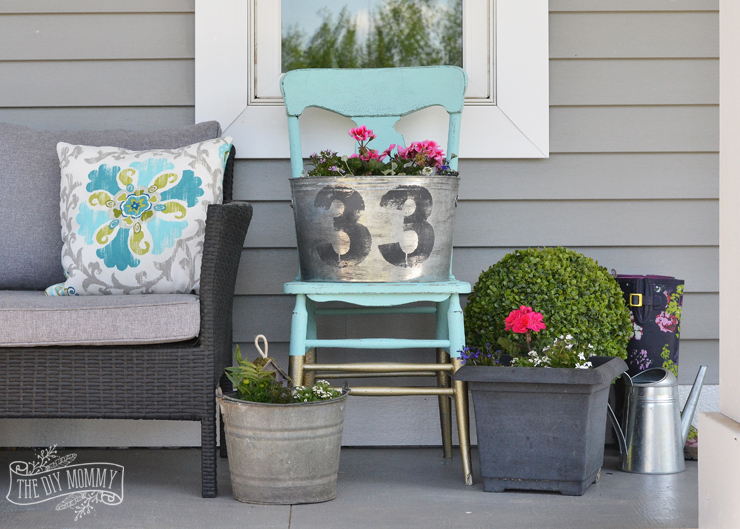 Your porch looks so cheery and welcoming! Pinning! I am in the process of choosing an aqua color to paint a chair of mine and I was wondering what color did u use on this chair? This is “Jamaica Bay” from Behr.